Kathy Martinez is assistant secretary, Office of Disability Employment Policy, for the Department of Labor. 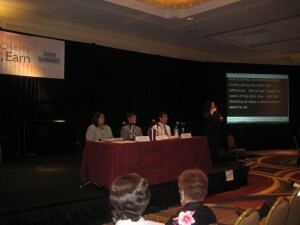 A long-time disability advocate, Martinez, who is blind, spoke at the National Council on Disability’s national policy summit on what her office is doing to make sure more jobs go to people with disabilities. It’s great to have [Hilda] Solis as my boss. I feel like we are woven into the fabric of the Department of Labor. We’re not sitting in the corner downstairs. Many people have given up looking for jobs. They believe they’ll lose their benefits if they go back to work. The labor statistics for June show that 14% of people with disabilities are unemployed vs. only 9% for people without disabilities. We need to create an “encouraged worker effect” to reverse the trend of discouraging workers from returning to the labor force. We’re working with federal and state partnerships like the Social Security Administration, the Department of Transportation, Health and Human Services [and others]. We just announced a $24 million disability employment initiative, and we’ll partner with Medicaid, Ticket to Work, vocational rehabilitation agencies across states. All these folks have a stake in the employment pathway for folks with disabilities. We’re creating models that use successful and universal employment strategies like universal design, customized employment, and flexible workplace concepts like telework. We want to ‘blend and braid’ the services that don’t typically work together, and we’re seeking proposals from everyone on how to do this. Additionally, we’re working with the Employment Training Administration to reauthorize and strengthen the Workforce Investment Act. President Obama is going to strengthen Section 503 of the Rehab Act of 1973. This requires federal contratctors and subcontratctors to hire people with disabilities [in order to get government dollars.] The Department of Labor’s Office of Federal Contracts Compliance is putting out an advance notice of proposed rulemaking to modernize Section 503. These contractors represent 22% of the workforce in country. We’ll have a tremendous impact on the employment of people with disabilities if the right regulations are in place. We want our minority brothers and sisters to do a better job of hiring people with disabilities, and we want to increase the capacity of minority-owned businesses to employ folks with disabilities. There’s a program called Add Us In that’s working on this. [Neil Jacobson, CEO of Abilicorp, a disability recruiting firm, says that unlike companies that measure hiring for race and gender reasons, nobody ‘counts’ how many people with disabilities are being hired.] We need to measure disability. Maybe there are affirmative action models that would be appropriate. That’s why we have the ANPRM, to encourage proposals from others around this issue. If you have an employment complaint about a public entity, contact the Department of Justice. If it’s a private entity, you must go through the Equal Opportunity Employment Commission, who can advocate on your behalf.